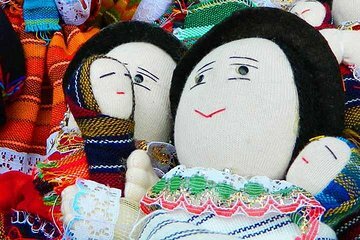 Combine a cultura com a natureza nesta excursão de dia inteiro de Otavalo Marketplace e Cuicocha Lagoa, ideal para visitantes de primeira viagem com tempo limitado do Equador. Partindo de Quito, você viajará para Otavalo Marketplace, uma das maiores da América do mercados, para as barracas coloridas, lembranças artesanais. Veja, também, a Cachoeira Peguche e Lagoa Cuicocha, em que você ll; desfrute de um breve passeio de barco. An amazing experience, very cold weather so be prepared for it. Top of the line tour guides who were friendly and knowledgeable. Could have done without the solar clock stop and the boat ride with more time in the market but overall a good tour. The guides on this trip were amazing and made the trip informative and fun loved stopping for the biscuits. They took pictures, answered questions, and kept us informed. We didn't get to go to the Cuicocha Lagoon, but on another boat ride that was on a lake. It was cold, wet, crowded, and the boat emitted a diesel smell. However, the rest of the trip was fun. Loved the stop at the sundial at the equator. I could have used a bit longer at the Marketplace because lunch happens here. The stroll to and the the waterfall was a highlight. Great day out into the mountains. Our guide Alex was excellent and our driver obviously very competent. The sights included were all enjoyed: great explanations at the equator, terrific boat ride in the live volcano crater, lovely waterfalls and a reasonable amount of time to shop at the market. An experience we couldnt have done without the tour! This was a great tour. Alexandro things interesting, and adapted to weather. Very informative, well worth the time and money. Also a plus was that I was able to book last minute and not have any complications. Really well done and interesting ! It was a great day--so many varied activities and time to spend at the market. Our guide, Fernando, was exceptional! I did many things on this tour. We visited the equator line, the Cuicocha lagoon, Octavolo market and Peguche Waterfall. It was a packed day with a lot of sightseeing. Stopping at the equator was a wonderful surprise. The guide Alfredo was excellent and very professional. We saw a lot and it was worthwhile. Long day - don't make plans for that night - may be back later than expected and tired! Only negative - too many people were squeezed on the boat tour. It was too crowded and would have been more pleasant by a long shot if folks were in two boats.